I don’t usually enjoy Christian allegorical fiction. But when I do, it’s thanks to novels like F. E. Greene’s “By Eyes Unseen” series. I don’t usually enjoy Christian allegorical fiction. But when I do, it’s when a series like F. E. Greene’s By Eyes Unseen series used allegory in a way I found enjoyable. 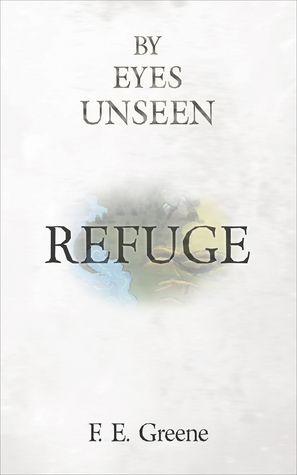 Greene’s series covers four books: Rescue, Refuge, Response, and Reward. In this series, an evil prince wants to open up a portal he plans to use to gain control of the world. Followers of the king must locate certain mysterious objects, scattered throughout the world, in order to open a hidden doorway that will give them a chance to close this portal and stop the prince. But the world outside the king’s castle is an unfriendly place, with enemies both human and supernatural, and the king’s people must travel to very dangerous places to find these objects. The world in this story is fairly big, and not very nice, which I appreciated. One place is filled with petty and vain people, another with rejected people; another location is feared for its violent people. I liked that there were a few safe places. This made the story more believable. Most of the main characters are fairly well developed. They don’t come off as caricatures or fakes. The series does well in giving several different characters chances to shine. It is constantly assured, especially in our Tolstoyan tendencies, that when the lion lies down with the lamb the lion becomes lamb-like. But that is brutal annexation and imperialism on the part of the lamb. That is simply the lamb absorbing the lion instead of the lion eating the lamb. The real problem is— Can the lion lie down with the lamb and still retain his royal ferocity? THAT is the problem the Church attempted; THAT is the miracle she achieved. As the reader learns, before Varrick came to follow the king, he was a ruthless and vicious soldier and killer. I don’t think it’s unfair to say that many Christian authors, if they had a similar character in a story, would essentially declaw him, making the lion act more like the lamb. But in this series, it’s plain that Varrick is very different from how he was, but he is still very much a lion, a hunter, a fighter. In fact, he had been given the job of taking someone who had been very lamb-like, a woman named Carys, and making her into a lion much like himself. You can read the story to see how that worked out. In this story’s world, technology has reached the level of our real world roughly 200 years ago. But the king’s followers often use more advanced technology. Though the story uses different names, clearly these people use things like flashlights and indoor plumbing, or even Frisbees and tennis balls. These things are said to be Beforish, but the event is never explained that these things were Before. Perhaps this term refers to something like The Fall, but I simply found myself wanting to know more about what happened. I would also quibble with how the king is portrayed, though such a character could be very difficult to get right. C. S. Lewis’s Chronicles of Narnia stories rightfully make Aslan imposing and regal and powerful, while also making him approachable and even playful at times. The king in these books is often approachable and very regular in his looks and manners, but I would have liked to see times when he was also very king-like, too. I found this to be an enjoyable series. Greene’s characters were well-done, the adventures offered good twists, and each story offered a good balance between action and drama.